You may have seen our latest analysis concerning Australia, but just as we have data for the UK and USA, we also have data for other English and non-English speaking countries: This time we want to put Canada in the spotlight. We will look at the top publishers in the desktop Google News Boxes (or News OneBoxes) for the past seven months. Furthermore, we will dive into the data for the most prominent publishers of the AMP Carousels in the mobile SERP. First off: Desktop Google News Boxes. Starting last September – we have reviewed Canada’s desktop Google News Boxes in the most recent months. By far the most visible publisher is cbc.ca. They start off amazing in September with a highscore of 28.64 percent and a gap of 18.62 percent to the second-best competitor. While they are still way ahead of the group this month, their visibility is down to 17.44 percent – and the gap has been minimized to a 11.16 percent difference. Still the gap is quite remarkable in national and international context. Normally the first two or three publishers are in a closer range. Whereas the first place is so clear the next places in the top 5 are not clear. As it is hard to distinguish between the publishers on the ranks two to five- we will showcase them in no particular order. First off, theguardian.com. A British publisher frequently very strong in an array of different countries – covering world-wide news. They have a good, but slow and slitghtly dropping curve. For most months they stay between 5 and 10 percent, but get 10.02 percent in September and 4.89 percent in February. Next, we have thestar.com. Levelwise, they are just as good as the other publishers in the range 2 to 5. Although, they begin great with visibilities between 7 and 10 percent between September and November, they then start tumbling down and reach their lowest score of 5.03 percent in January. While they do recover in February, they are visibly not as strong as they were last fall. Theglobeandmail.com is another candidate in the top 5 and their curve takes a similar course as thestar.com‘s. They reach their maximum of 7.84 in September and their minimum of 4.27 in March. Last but certainly not least, we present globalnews.ca as part of the top 5. Just as many in the top 5, they score great until November with visibility values between 7 and 9 percent, but they are down to 4.94 in March. Seeing the top 5 is great, but we also want to have a little peek in the top 10. Impressively enough, theguardian.com is not alone as an international publisher. Neighboring publishers from the USA are having some share of prominent placements in Canadian news relevant Google OneBoxes. US-American publishers in the top 10 are: yahoo.com, nytimes.com and cnn.com. Another foreign highly visible publisher is dailymail.co.uk. Nevertheless it is remarkable that the British publishers perform in minimum as good as the big US publishers nytimes.com and cnn.com. Let us now figure out, who we see in the AMP Carousels in the mobile SERP. Perhaps some familiar faces? Right of the gate, cbc.ca is the leader of the pack. However, the distance is not far off. Again, they start off incredibly strong with 42.78 percent visibility in September, but slowly lose percentage and reach their lowest visibility with 26.01 percent in March. The rest of the competitors are somewhat close, though not as mingled as in the desktop News Boxes. Here we can differentiate the runner-up theguardian.com – another familiar occurrence. Repeatedly, a slowly down facing curve with a maximum of 27.84 percent in October and a minimum of 17.16 percent in March. On third position is a new face in this analysis: yahoo.com. But, we have seen them before as a strong mobile publisher on the US market. Throughout the last 7 months they had some strong ups in September, October and January and a nearly equal amount of lows, though an overall decreasing score. 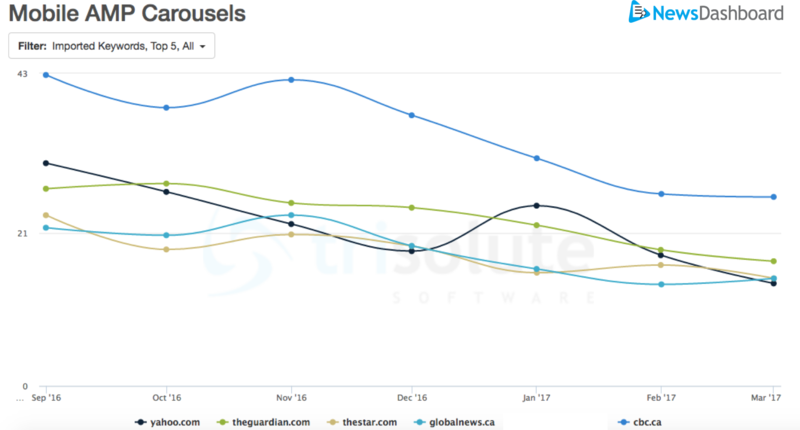 Fourth position is taken by globalnews.ca another strong Canadian publisher with scores between 13 and 24 percent visibility. 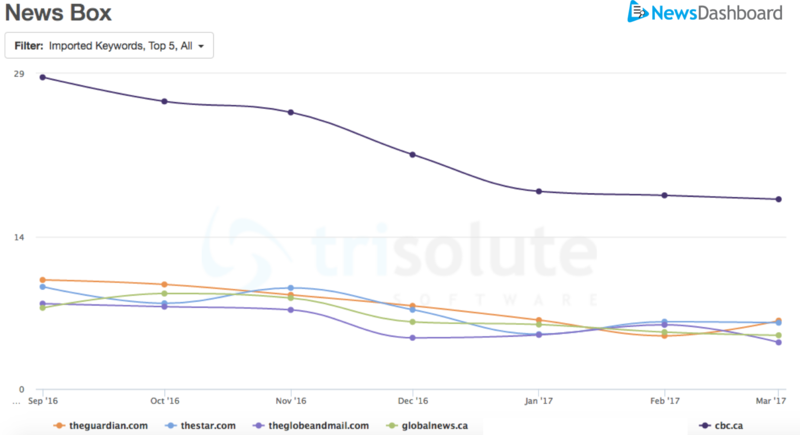 Thestar.com is also again part of the top 5 with a similar curve as globalnews.ca, but slightly lower individual values. But we can see all Top 5 publishers in a slight downside trend, so we had a look at the developments of the publishers from position 5 to 10. And there is beside smaller changes one quite remarkable development which we depict in the next chart. The dailymail.co.uk was on lower visibility levels in 2016 and still in Januar 2017 (8.82 percent in January). Therefore they did not rank under the Top 5 for the long time period. But they have a remarkable uprising of visibility figures since the end of January. Their development led them up to now to visibility figures of over 22 percent for the AMP carousels and to the second rank. This is remarkable and we will look if this development continues. For the other top 10 publishers we can say following: There are two Canadian publishers – theglobeandmail.com and nationalpost.com. However, we have, next to the other international publishers and dailymail.co.uk in the top 5, two more British-based publisher in the top 10: bbc.co.uk and independent.co.uk. Overall we observe that cbc.ca is by far the strongest publisher in Canada as desktop News Boxes and AMP carousel visibilty is concerned. Though the competition is getting closer. Especially the development of dailymail.co.uk in the AMP carousels from beginning of Feb 2017 till now is remarkable. We will analyse how this develops in the future. Most other publishers are equally strong for desktop and for mobile. 5 places in each department are taken by either British or US based publishers.